I think it’s important to emphasize that I’m not a digital marketer! Fashion and style are my thing with a side of social work (crazy combo I know, but it works!). So when Sharp Heels asked me to cover INBOUND 2015, a marketing conference in Boston, I hesitated. Actually, I panicked. I was eons above my comfort zone for a number of reasons. 1. I know very little about the online world (although I try hard and sometimes pretend) 2. There would be 14,000 people at this event and I would know all of zero. 3. I would feel like a fish out of water. It would be like entering a foreign country and not speaking the language. 4. I would have to carve a few days out of my crazy schedule. All valid reasons, right? But when my 25 year-old high tech son (who owns a video game company!) said, “Mom, INBOUND is an amazing event. You HAVE to go to it!” I listened. After all, we need to stretch the limits sometimes or life can get boring. OK, the real reason is that 25 year-olds know everything and they’re usually right. I spent two full days at INBOUND and I have to admit, it was hard to leave. This conference is like nothing I’ve ever experienced. I was expecting a hard-core marketing event (heavy on pushy sales pitches), but instead I got something bordering on warm and fuzzy. Let me explain. Inbound marketing is not about the macho “in your face” sales approach, but more about connecting, caring and sharing. Inbound is about making a difference in the world and understanding those around us. The conference promoted this philosophy. In some offbeat way, I felt like Inbound 2015 almost had “feminine side” if this makes any sense. How can compassion equate with marketing? So let’s start from the beginning. What exactly is Inbound Marketing? I will be honest… I had no idea before I attended the conference. Hubspot, the leader in Inbound Marketing defines it this way. 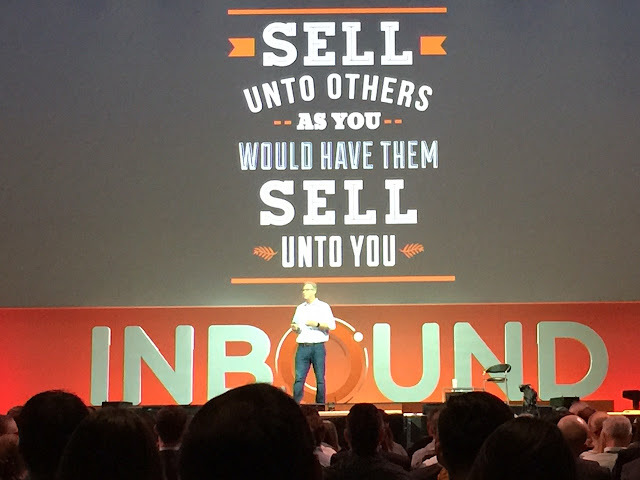 INBOUND 2015 encapsulated this holistic approach to marketing. The theme was about connecting-- but not just on a superficial level. It was deeper. It was about getting in touch with your inner self and with others, and understanding how we tick and interact. It was about going after what’s important, following passions and being our authentic self. It was about women’s rights, ending sexual violence and beating the odds when illness strikes. INBOUND knows no bounds. It touched on everything that matters to me both as a woman and a human being. It was truly a wonderful thing to see” a business with a heart and soul”. From a “newbie’s” prospective, here’s what I loved about INBOUND 2015. The excitement! The conference itself was larger than life. It was like a mix between Disney World and Las Vegas. From a high-tech vendor area complete with games, giveaways, crazy light displays, energizing music and interactive exhibits to a speaker line-up that would knock your socks off, there was constant excitement in the air. Where else could you hear talks from so many amazing and diverse “celebs” such as Seth Godin, Amy Schumer, Brené Brown,, Daniel Pink Chelsea Clinton, Brian Halligan, Dharmesh Shah, Sohpia Amoruso, Jonah Peretti, Marc Maron and Jon Ronson? Yep, they were all featured in one week. Stepping into “Club Inbound” was invigorating. the local hotspot for photos. The keynote speakers were nothing short of incredible. My two favorites were Chelsea Clinton and Brené Brown…both brilliant and inspiring women. I attended several talks and was surprised by the quality of the presenters. Not only were they knowledgeable, but also energetic, motivating and captivating. I didn’t see one audience member nod off-- and that’s a first! I had a chance to meet Lisa Genova, author of Still Alice, a novel about a woman diagnosed with Alzheimer's Disease. The book was made into a movie which won Julianne Moore an Oscar. Lisa told the audience to ask themselves this question. " If I could do anything I wanted and didn’t have to care about what people thought of me or worry about money, what would that be?" Her message was powerful...listen to your heart, take chances and "be comfortable being uncomfortable." I applaud INBOUND for their commitment to promoting social justice by supporting The Malala Fund (their charity partner). The Malala Fund, led by Malala Yousafzi, focuses on a mission to provide and advocate for education to girls worldwide. The documentary “He Named Me Malala” will be released in October 2015. The tips: Even for a layperson like me, I got hands-on tips and advice for blogging, branding, social media-- even money management was covered. I learned some new terms like “smarketing”, “meme” and “CTA or call to action “. If you’re dying to know what these words mean, find the definitions here. The people: With 14,000 people congregated at The Boston Convention Center, you might think that the atmosphere would be a bit cold and impersonal. Quite the contrary, from the vendors to the speakers and attendees, people were friendly and eager to make connections. The fun: Inbound 2015 was just plain fun. I mean who doesn’t love a party? A big thank you to Sharp Heels, a website for professional women, for sending me to INBOUND 2015. One last thing, you might be wondering what I wore to INBOUND. Comfortable clothes! Day 1: Simple "no wrinkle" black sheath dress with comfy flats and a large tote for storing all my gear. I also brought a sweater in case the a/c was blasting (which is was). Day 2: Black jeans, a silky top, comfy sandals and another monster bag. So sad but true Andrea! The 1st condition of success in business is, you have to connect with the customer and have to know whats they want. Inbound marketing can help you to directly communicate with the customer and know their needs, wants and demands.